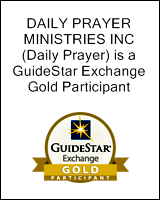 Daily Prayer is completely free, including all membership features. However, spreading the Word of Christ on the internet is not free. The content of ads is not determined by Daily Prayer, but by your computer. If you see something you consider objectionable, it is an opportunity for you to examine what websites your have been visiting. Contributors (of any amount) can ask to have advertising turned off. If you shop at Amazon.com, use the link (above) to get there, and Daily Prayer will receive a small donation from them. 37 'He who loves father or mother more than Me is not worthy of Me; and he who loves son or daughter more than Me is not worthy of Me. 38 'And he who does not take his cross and follow after Me is not worthy of Me. Please note that, if you want a book from the Apocrypha (1 Esdras, 2 Esdras, Greek Additions to Esther, 1 Maccabees, 2 Maccabees, Tobit, Judith, Wisdom of Solomon, Sirach, Baruch, Epistle of Jeremiah, Susannah, Azariah, Manasseh, Bel and the Dragon) they are currently available only by choosing "Apocrypha - King James Version". Other than Epistle of Jeremiah, you only need the first five letters of the book name (and actually, in some cases you can use just the first three or four, e.g. "Bel"). For the Greek Additions to Ester, you can use "Greek" as the book name. For Ecclesiasticus, please use its alternate name, "Sirach". © 2008 - 2019 Daily Prayer Ministries, Inc.